The T5553-C2-A PID Controller Module adds to the T5553 Process Control Learning System to provide microprocessor-based PID control of process control systems. The T5553-C2-A consists of a powerful Honeywell PID controller that is mounted and wired to a panel that attaches to the T5553 control panel. 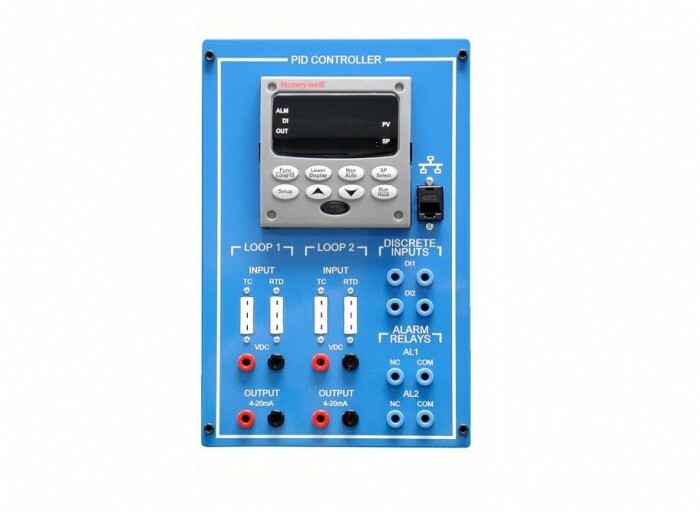 The controller includes set point programming, dual-loop control plus internal cascade, universal analog inputs, 4-20 mA analog outputs, alarm relay outputs, and discrete inputs which can be programmed to control processes using either closed loop analog control or open loop analog control. All I/O connections are made with plug jacks and connectors which are compatible with the connections on the T5553 System. Also supports advanced control methods such as ratio, feed forward, and cascade control.